An embossing seal consists of a press and a pair of jaws. The jaws contain a die and counter which make an embossed impression. They are usually circular but sometimes rectangular and can be used to permanently authenticate documents. 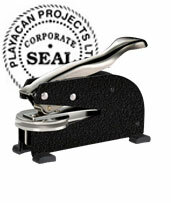 There are two types of seals, desk seals and pocket seals. We have three standard types of the embossing seals, the long reach desk which has a 1 3/4 inch die, a short reach desk seal with a 1 5/8 inch die and a pocket seal with a 1 5/8 inch die. 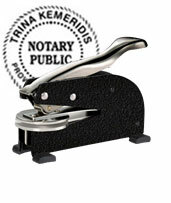 Seals and embossers can be used in a variety of applications; Certificates of Achievement, Notary Public, Commissioner for Oaths, Wedding or Personal Invitations, Scrapbooking, and as gifts and awards themselves.